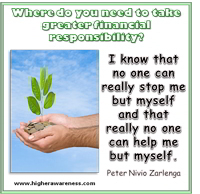 Where do you need to take greater financial responsibilty? YOU are responsible for earning a sufficient livelihood and for managing the money in your life. No one can do this for you. Do you need to learn new skills or apply what you already know?